Right now, somewhere in South Beach, a guy is palming a valet a fifty to make sure he parks his yellow Lamborghini in front of the club, where he and his bikini-model date will sip syrupy $18 caipirinhas at an Ocean Drive hot spot owned by an ’80s pop star. Welcome to Miami! But that’s not the Miami for you. There’s another one now — one that’s more refined, more authentic, swayed more by culture than celebrity. It’s a Miami that will reward your good taste with sophisticated cocktail bars, world class art, and a wave of inventive food from around the world and around the corner. And it’s mostly happening everywhere but in South Beach. Magic City’s latest rebirth grew from the ashes of 2008’s financial collapse, when Miami was exhibit A of a real estate bubble burst, a cautionary tale of overbuilding with sky-high columns of empty luxury condos and idle cranes left dotting the skyline. But Miami bounced back fast, thanks to an influx of Russian rubles and Brazilian reals, and a wave of young entrepreneurs seeking cheap rents and opportunity, and willfully ignoring the inevitability of rising sea levels. As a result, Miami no longer feels like God’s waiting room, as the joke goes, but more like Seattle on the beach, if Seattle imported a few hundred thousand South Americans and built gleaming glass towers to house them all. Miami is no longer the concentrated, one-hit wonder it was when tourists contained themselves to the 1.3-mile strip of Miami Beach’s Ocean Drive. Now there’s energy scattered everywhere. All you have to do is know where to look. Long before the Wynwood neighborhood was the sort of place where you could buy a longboard or get your mustache waxed, graffiti artists tagged its warehouse walls with artful and ambitious full-size murals, many commissioned by building owners to preempt future tagging. “If you have enough cred,” says David Anasagasti, better known as the street artist Ahol Sniffs Glue, “after you wall something out, no one else will go over it.” Several years ago the late urban revivalist Tony Goldman sensed a chance to inject new life into a gritty, overlooked neighborhood, as he did with New York’s SoHo in the late ’70s, and later, in South Beach’s art deco hotel district in the late ’80s. 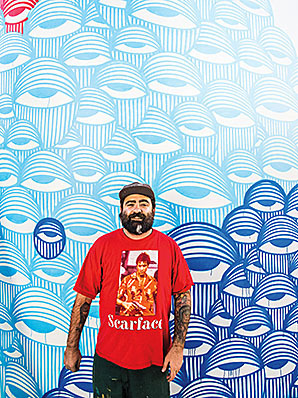 He invited the world’s most prominent street artists (Kenny Scharf, Shepard Fairey, and others) to paint designated concrete walls throughout the area. Wynwood Walls remade the neighborhood, which now is home to galleries, green juice joints, and, this being Florida, an adorable floral shop nestled up against Lock & Load, an automatic-weapons firing range. Most every bar has an indoor/outdoor space that’s irresistible to anyone seeking sun, good music, and alcohol. With its swordfish murals, tables made from speedboat pin striping and Dolphins posters, Gramps honors ’80s Miami. Wood Tavern, a bar that was the center of neighborhood life during its transformation has an enviable outdoor space where dogs loll on the sun-baked concrete and beautiful (normal) girls play Jenga, while the sound system pumps out ’70s R&B of the sort Questlove might have spun when he DJ’d here back in October. It’s more intrinsically Miami to rip around Biscayne Bay on a Jet Ski, but a stand-up paddleboard is perfect for discreetly gliding through Miami’s posh island suburbs — the kind with infinity pools and matte black powerboats moored in the backyard — on envy-inducing house tours. And once you’re back on solid ground, the bay side of Miami Beach shows a more mature Miami that caters to locals as well as interlopers. “Look, there are three cities in America where people go to intentionally make bad decisions — New Orleans, Vegas, and Miami,” Wagner says. 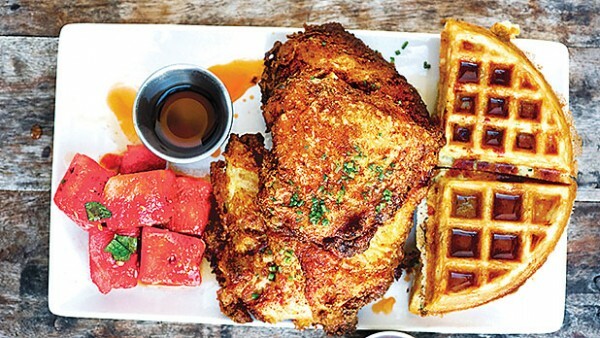 “But we’re here 365 days a year, not just for one head-banging weekend.” Yardbird Southern Table & Bar is a dream of a neighborhood restaurant with a famous 27-hour-brine fried chicken, cheddar waffles, and watermelon crudo on a Southern menu that’s as broadly appealing as comfort food can be. Less than a mile away is a feat of urban planning that will make you question your knee-jerk embrace of the old: a brand-new two-block strip of cafes, gyms, and chain-free restaurants that seems to have been built entirely to serve the residents of the monstrous, gleaming condo tower that looms over it. Your longing for a sense of history will dissipate once you dig into a bowl of king crab pasta at the nearby Pubbelly. Depending on who you talk to, the cluster of new skyscrapers that stretches along Miami’s eastern Bayshore is either the best neighborhood in North America, the nation’s largest construction site, or everything that’s wrong with the new Miami. But even if this collection of full-service high-rises in what used to be Miami’s sleepy financial center, isn’t your idea of neighborhood, it’s not your burden to argue about it. All you have to do is enjoy it, and the obvious first approach is as culinary tourist. Brickell’s lux high-rises have attracted the world’s profit-minded restaurateurs, which means you can try one of Daniel Boulud’s famous truffle burgers without going to New York, sample Zuma’s robata-grilled beef from Japan, or dig in to bone marrow tacos at the new Cantina La Veinte without going to Mexico City. The world’s chefs have descended on Brickell, which is worth at least one night of your trip. Stick around for a drink, as there are glamorous outposts of nightlife everywhere. Just look for the guy in the Lamborghini.